Hope sits on the banks of BC's mighty Fraser River surrounded by the towering Cascade Mountains. 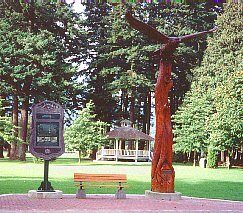 The picturesque small town of Hope is strategically located at the junctions of Highways #1, #3, #5 and #7, so it offers a wide variety of lodging, accommodations, services and recreation opportunities. 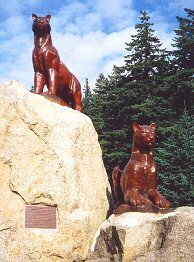 The early history of the area comes to life not only in the Hope Museum, but in many of the surrounding attractions such as the Yale Historic Site, the Coquihalla Canyon Provincial Park and the Alexandra Bridge Provincial Park. At the Hope museum, learn more about Simon Fraser who came this way in his search for a route to the Pacific and of the Hudson's Bay Company who followed and established Fort Hope and nearby Fort Yale; of the thousands of miners seeking riches during the Fraser River Gold Rush; the sternwheelers; railroaders; and early pioneers. The rich culture of the Sto:Lo aboriginal peoples is vividly depicted alongside the European culture. Hope has been used by Hollywood as a filming location for many major motion pictures so the scenery in and around the town may look familiar to visitors. Hope is therefore known as the birthplace of the Rambo character played by Sylvester Stallone, as this is where the initial Rambo film - "First Blood" - was made. There are self guided "First Blood" filming location tour maps available at the Hope Visitor Centre & Museum Complex along with Rambo memorabilia on display and Rambo souvenirs for sale. Other movies made in Hope include "Fire With Fire", "Shoot to Kill" and "Hope Springs". Travelling north and east, travelers can definitely look upon Hope as a gateway to British Columbia's outdoor adventure opportunities. With so many sights and activities nearby, Hope is a daytrippers' paradise. From Hope they can gaze upon such diverse sights as towering mountain peaks, the mighty Fraser River, remote wilderness valleys and various lakes and streams as well as historical spots. These intriguing sights can lead to such outdoor adventure activities as river rafting, rock hounding, camping, hiking, gold panning and skiing. Accommodations: There are a number of hotels and motels in Hope and the surrounding area as well as private and provincial campsites in the vicinity. Elevation: 42 m. (138 ft.). 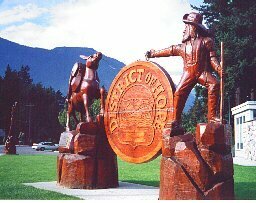 Access: Hope, British Columbia is at the junctions of BC Highways #1, #3, #5 and #7 so is easily accessed from all parts of BC and the US. It is 53 km (33 mi.) east of Chilliwack on Highway 1, 184 km (110 mi.) southwest of Kamloops via the Coquihalla Pass on Highway 5 or 275 km (171 miles) via the scenic Fraser & Thompson canyon route on Highway 1. The community is served by Greyhound bus lines and Via Rail passenger railway lines. Local Attractions: Hope Arts Gallery, Muskwa Gallery native crafts, Hope Museum, Christ Church Anglican National Historic Site, Manning Provincial Park, Skagit Valley Provincial Park, Hope Slide, Hell's Gate Airtram , self-guided tour of chainsaw wood carvings, Othello-Quintette Tunnels in the Coquihalla Canyon Provincial Park, Yale Historic Site, Alexandra Bridge Provincial Park, Bridal Falls Provincial Park, Minter Gardens and Bridal Falls Waterpark.